Tents all en suite with 24 hr hot water showers. Designed with all comforts and all river facing. 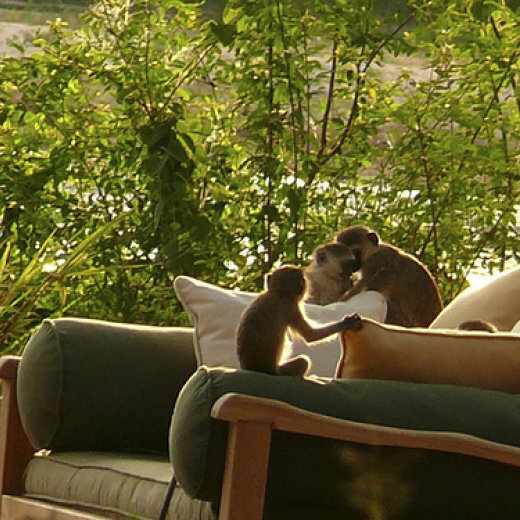 Tsavo Safari Camp is located in the northern sector of Tsavo East National Park. The camp nestles between the bank of the Athi-Galana River and the worlds' largest lava flow, the Yatta Plateau. Tsavo East National Park retains a pristine environment and complete ecosystem, sustaining the largest mammalian, ornithological, reptilian and insect diversity in the region. An ornithologist’s paradise and an extensive range of thrilling wildlife, living in harmony. An abundance of vegetation, in both variety and volume, includes the frankincense and myrrh of biblical importance. 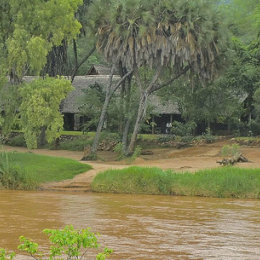 Tsavo Safari Camp’s accommodation comprises of all en suite tents facing the river and gardens. Each room has a private veranda, elegantly furnished and provides all comforts. The swimming pool is shaded under the Doum palm trees with spectacular views. The Camp is fully furnished en suite tents face the Galana River with bathroom, hot and cold running water, shower, flush toilet and each a private veranda facing the river where many animals come to drink water. Massages and spa treatments are available.